Description: (Obverse) The effigy of the reigning sovereign, George V with text around GEORGIVS V BRITT OMN REX ET IND IMP; (Reverse) a four line inscription across the field FOR DISTINGUISHED CONDUCT IN THE FIELD. Ribbon: Crimson with dark blue central stripe. Comments: The need for a gallantry medal for other ranks (not officers) was first recognised during the Crimean War. 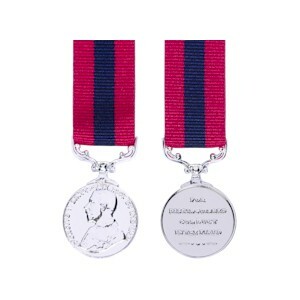 The medals have always been issued named, and carry the number, rank and name of the recipient on the rim, together with the date of the act of gallantry, from 1881 until about 1901. Bars were given for subsequent awards and these too were dated from the first issued in 1881 until 1916 when the more usual laurelled bars were adopted. Since 1916 it has ranked as a superior decoration to the Military Medal and, as a result, has been replaced by the Conspicuous Gallantry Cross.